The monoblock design SIL pumps are available with integrated or IEC motors. The new SIL pump range was developed to meet the process requirements in various general and industrial applications and is designed for clean liquid processes. Suited for pumping mainly clean and slightly contaminated liquids, viscous liquids up to 250 cSt, and fibrous slurries up to a consistency of 1%, the hydraulic design has a low NPSHr (net positive suction head required) across the whole pump range. The pump is of inline design together with monoblock construction. It is available either with an integrated motor or with a standard IEC motor. 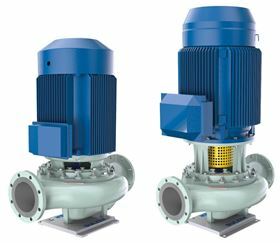 SIL pumps can be installed in both in vertical and in horizontal positions, requiring only a small installation space. The pump range fulfills the efficiency regulations across all industries as well as the design requirements of the ISO 5199 international standard.It exceeds the European Union‘s requirements for energy-related products (ErP). These regulations specify the minimum efficiency values for water pumps, with the target of reducing the energy consumption. The entire pump range exceeds the MEI 0.4 (Minimum Efficiency Index). MEI, the minimum efficiency index for standardized water pumps, was set to be ≥0.4 as of the beginning of 2015.